By Dan Grennan | October 11, 2017. 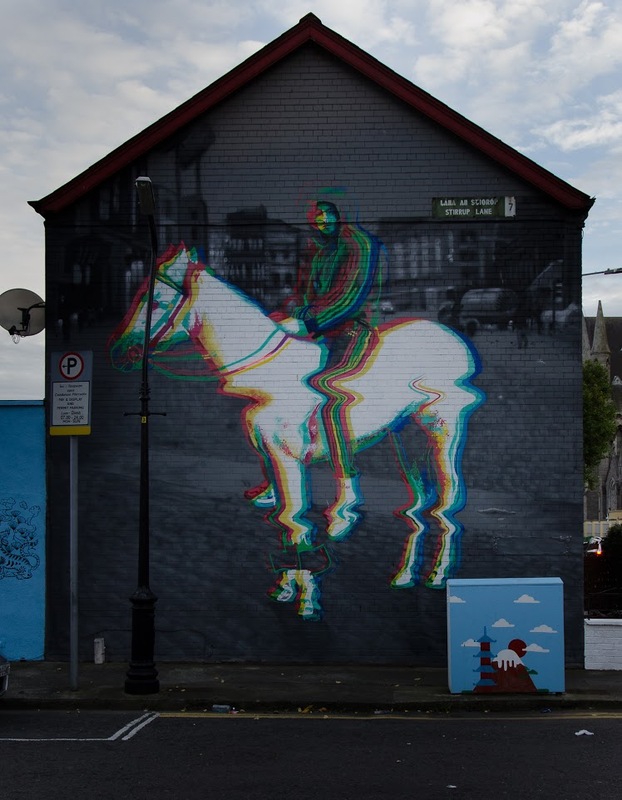 ‘Horse boy’ has brought a new lease of life to Smithfield’s Stirrup lane. The large mural on the gable end of Vincent O’Donoghue’s semi-detached house, just around the corner from The Cobblestone pub, features a young man on a horse in Smithfield square. The mural came about when local resident Vincent O’Donoghue approached a collective of artists called ‘Subset’ while they were painting the Stormzy mural just around the corner. Mr. Donoghue offered to sponsor a mural on the gable end of his house on Stirrup lane. Subset took the offer and went about looking for inspiration in the local culture and traditions. Horse culture has a long history of culture and tradition in the area with Smithfield horse show taking place a stone’s-throw-away in Smithfield square. The lane’s name also has a literal connection, a ‘stirrup’ is the part of a saddle where the rider places their feet. Subset discovered a portrait picture of a young lad on a horse in Smithfield square taken by James Horan while he worked in Ireland as a news photographer between 2007 and 2011. The photo was part of his photo exhibition called ‘Irish gypsy horse culture’ which featured in the 2014 Sydney Head On photo festival in Australia. Subset decided this was to be the inspiration for the mural. But the boy in the image never knew a thing about it. David (Dotsy) O’Donnell is the young lad on the horse in the picture. The picture was taken when he was a young teen, still horse riding. Some of his mates kept up the hobby, but now in his 20s, O’Donnell has had to give it up because he is too busy working to find the time to look after a horse. As for the mural: “I think it’s great. I was in work and one of the lads in the job was driving past it on his way home and noticed me straight away. He told me about it but I never believed him. There are disagreements between the photographer and artist and Dotsy O’Donnell, but one thing they can all agree on: the mural is a beauty.